The first car I ever owned, personally, was an old Valiant Chrysler that my brother-in-law gave me. It was a tank. I mean it. Thick with steel so tough and heavy that it seemed the best thing to be driving on the not so safe environment of a road. I was so thrilled to have my own car. I was well into adulthood by the time I got it. My husband had always done the driving because I was too scared to learn after seeing my sister crash the family car into the front porch during the only lesson my mother gave her when I was younger. So I didn’t even get my license until I was heavily pregnant with my third child (and could only just fit my big belly behind the steering wheel). It was a few years after that when I got the car. I felt like I’d won lotto …but I didn’t have it for long. At that time, I was working late at night as a cinema usherette and driving back home on country roads in almost black conditions. (We lived in a small seaside town, half an hour from the city). I didn’t give too much attention to those little voices back then, so I just kept driving. Halfway down the long dark road, another car slowed my momentum, so I pulled out to pass. At the same time, I saw headlights in the distance. I panicked, too tired to assess effectively how far away they still were, and tried to pull the car back in. Instead, I overcompensated on the steering wheel (no power steering in such an old car), and suddenly found myself going ‘slow motion’ like a carousel on the road. (Well, it seemed that way). Spinning round and around until the car came to a stop against a concrete light pole on the other side. It hit the pole with a bump that smashed the windscreen to smithereens, and made the engine jump out of its housing to leave a massive dent in the bonnet. I sat behind the wheel and looked at the pole now embedded between the doors on the passenger side of my car. The vehicle I’d tried to pass had carried on its way, unaware of what had happened. The headlights of the oncoming traffic didn’t arrive as an actual car until well after I’d got out the door, took a look at the now truly convex car bonnet, and had been to the other side to see how the pole had embedded itself halfway into the steel chassis. That was a surprise. Modern cars that were around at the time would have crumpled into a tin foil ball around that pole with such an impact, but the Valiant was perfectly okay apart from the bonnet and the half moon shape in its side. It had proved its worth. So the little voice in my head was right. Something did happen, and I was okay. I walked away from that accident and hitched a lift home with the car I’d tried to avoid crashing into (that had been the distant headlights), after it slowed to check the scene when it finally came upon me. (Which was lucky, because these were the days before mobile phones and if it hadn’t stopped, I would have had to walk ten kilometers in my high heels). All I had was a bit of whiplash when I went to see the doctor (or so I thought… it was thirty years later before the real damage showed with severely increased degeneration in my spine). The car was a write off, though. Even steel tanks don’t drive too well with an un-housed engine, a convex bonnet, and a two foot inroad on their side. I gave up my job at the cinema after that. The hours were too late, the drive too long, and I had small kids who needed a mother. I was lucky that the car had not done one more spin on the road and crashed the pole into the driver’s side, instead, so I cut my losses and left… but I missed having a car. Months later, I saw an old Volkswagen for sale. It had seen better days. It was already thirty years old but it was cheap and I could buy it and, better yet, my husband was able to get it going. Again, it was my own car. The paintwork was old and cream colored. I bought some cans of red spray paint, thinking I would turn it into a ladybug – all red with black spots – and I did start that artwork but it never got finished. 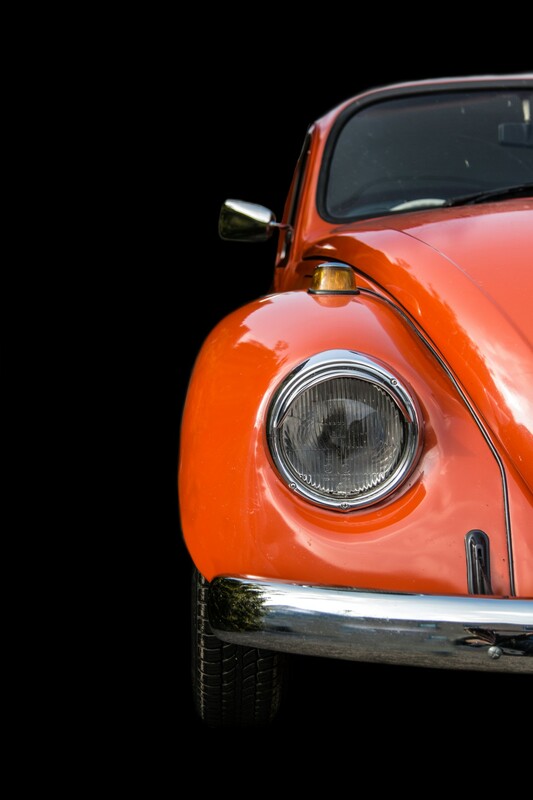 Instead, it was simply a cream colored Volkswagen part painted in red, and with red splotches over all the rest. My kids loved that car. The movie about ‘Herbie, the Love Bug’ was still being aired. Volkswagens were very popular. Fact is, it seemed that lots of kids loved that car. I’ve always wondered why. Maybe it was because of the movie but there were lots of other Volkswagens around, then, and kids didn’t seem to run all excited after those cars like they did after mine. If it had been actually finished in the artwork I’d wanted to put on it, I could understand, because it would have been a ladybug (ladybird), but it wasn’t. So there seemed to be no reason why kids ran after my car whenever they saw me driving around the estate where I lived. It was a splotchy red and cream car, that looked like an abstract painting rather than anything in particular. Yes, it was unique, but it didn’t seem to be that attractive. If it had been guys running after the car, I might have thought, ah, it’s not the car, it’s me – but they weren’t guys, they were the local little kids, and I didn’t even know them, personally. I had a soft spot for the car, too, but it broke down a lot and since it was the days before mobile phones I often had to walk to the nearest house (which wasn’t always so near) to ask if I could use their phone to call my husband to come tow it. In time, we had enough money to upgrade to a new Holden Commodore, that ran better and also had air-conditioning and power steering, (which I didn’t know I missed until I had them). I didn’t want to just sell my beloved little car. I wanted it to go somewhere it would be respected. It had done me good service. So I gave it to my younger sister-in-law as her very first car. Not long after she began driving it, my lovely Bug gave up the ghost. My sister-in-law complained that I had given her a dud. Well, it was working fine all the time I had it (after my husband got it going each time it broke down). There were many things I didn’t miss about driving that little car once I got the perks that came with my new one but I’ll never forget the fun times we had together, the freedom it gave me as it took me places and the squeals of delight from the local kids as they tried to chase it.